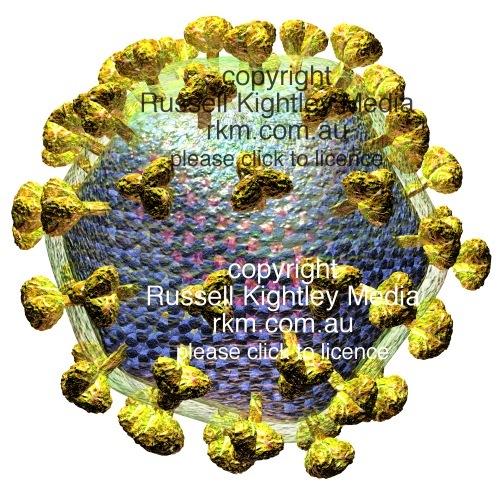 Model of HIV AIDS virus particle. The above image is 500 pixels across, the original measures 4000 pixels across. Model showing faceted structure and laevo symmetry of spikes. The golden spikes (or knobs) are the trimeric envelope proteins.These help the virus to attach to target cells and hence invade the cell. The spikes are composed of three copies each (hence trimeric) ofgp120 (outer knob) and gp41 (stalk, trans-membrane section, and cytoplasmic tail). Next comes the viral envelope (translucent green) derived from the host cell plasma membrane during budding of the virus particle. Immediately beneath the viral envelope envelope lie the matrix proteins (MA: blue cage-like structure). Lying across the internal space of the virion is the purple capsid (or core). This bullet-shaped structure contains the viral genome (in the case of HIV this is two strands of RNA) and the enzyme reverse transcriptase.